MMAWeekly.com is on location from the Allstate Arena in Rosemont, Illinios for UFC 90 providing live results and play-by-play for the entire night of action. 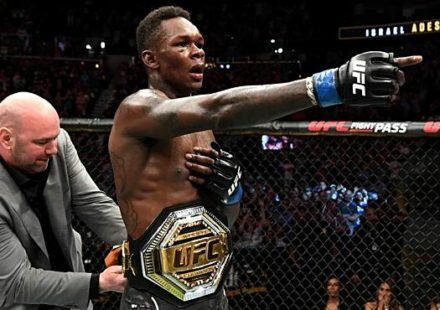 UFC middleweight champion and No. 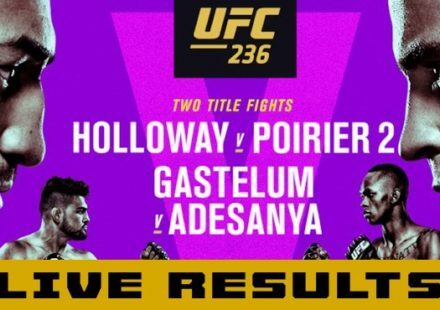 1 ranked 185-pounder Anderson “The Spider” Silva takes on hard hitting Canadian Patrick “The predator” Cote in the main event. Thiago Alves and Josh Koscheck face off in a No. 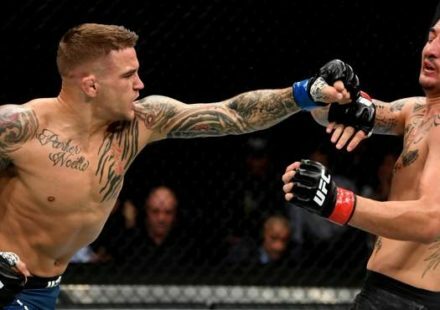 1 contender’s bout in the welterweight division while former UFC lightweight titleholder Sean Sherk and Tyson Griffin compete in a lightweight match with a lot of implications. R1- Cote throw low kick early. Both fighters circle, trying to feel each other out. 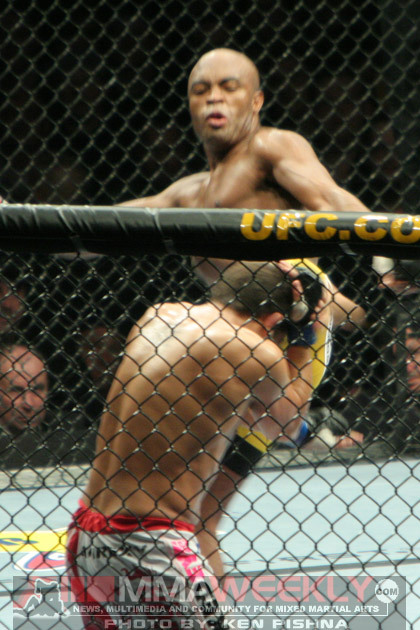 Silva lands a low kick. Silva starting to warm up, lands a straight left. Anderson lands a big knee that rocked Cote briefly. R2 – Anderson lands a nice straight left and chases Cote down, they clinch against the cage. Cote goes for a takedown but Silva reverses, landing in his full guard. Silva lets him back up. Silva taunting Cote with his arm movements. Cote attempts a single leg but is unsuccessful. He pushes Silva up against the fence but is unable to take him down. The round ends with a few knees from the clinch by Silva. R3 – Cote lands a right hand and a leg kick to start the third. Cote pops his knee trying to close the distance and falls to the canvas in pain. Referee calls a halt to the fight due to knee injury. Anderson Silva retains his middleweight title at 0:39 of round 3. R1- Koscheck tries a side kick but slip. Alves rocks Koscheck, forcing him to scramble for a takedown. He eventually regains his composure. Alves lands a high kick but Kos comes back with a small combo of his own. Josh lands a nice overhand right followed by a body shot. Koscheck force Alves against the cage and is looking to take him down. Thiago breaks free and lands some low kicks in the center of the cage. R2 – Koscheck misses with an uppercut but begins to throw his hands more. Koscheck throws a high kick that is blocked. The American Kickboxing Academy fighter pins his Brazilian opponent against the fence but the two eventually break free. Alves comes in with a nice kick combination and Josh lands a body shot later. Koscheck attempts another takedown against the fence but is unsuccessful again. Close round. R3 – Alves rocks Josh with a combo and he resorts to scrambling for a takedown again. Koscheck recovers only to be greeted by a right hand. Alves landing with the low kicks while Koscheck misses with overhand rights. A left jab inadvertently hits Thiago in the eye, the fight is stopped momentarily. A low kick buckles Koscheck’s left leg. Both fighters exchange and then Alves lands a superman punch. The fight ends with Alves taking Josh down. R1- Both fighters circle early. Clementi moving forward but neither fighter landing a lot. Maynard lands a knee to the body both guys seem content to stand. Maynard gets the takedown with under two minutes remaining, landing in half guard. Clementi gets full guard and the round ends with Gray throwing strikes. R2 – Maynard lands a nice combination early while Clementi responds with a low and high kick. Maynard picks up Clementi and slams him down. Rich reverses himself back up but is taken down again. Gray throwing strikes from half guard. Gray tries for a guillotine but Clementi holds onto his right arm. Maynard postures up and throws a few strikes as the round closes. R3 – Maynard slams Clementi down early, lands in full guard. Gray moves to side control as the fans begin to get restless. Clementi momentarily reverses himself back up but is taken down again by the Xtreme Couture fighter. R1- Werdum throws a low kick early while parrying away from Dos Santos. A right hand lands clean and puts Werdum down. A barrage of strikes afterwards forces the ref to halt the fight. R1- Both fighters start with low stances, respecting each other’s skills. Sherk gets a takedown along the fence, eventually taking Griffin’s back. 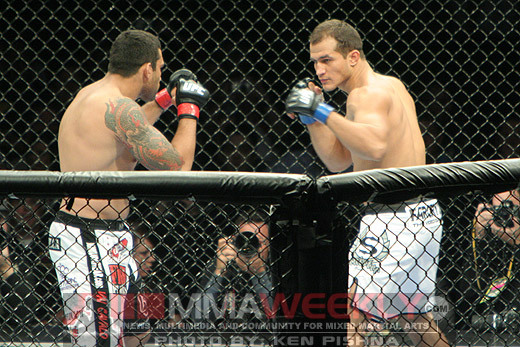 Tyson stands up and walks Sherk to the opposite side of the cage and shrugged him off. Sherk throwing some nice combinations before forcing Griffin back to the fence and taking him down. Griffin gets back up and lands a nice straight right as they break. Both fighters are entertaining the fans with nice exchanges, proving that they’re not just wrestlers. Sherk momentarily takes Tyson’s back but is eventually shrugged off. Sherk beginning to land and win the exchanges. R2 – Both fighters displaying their striking early with Sherk edging him out. Griffin throws a body kick that glances off Sherk, Sean responds with a combination. Sherk is gaining confidence with his hands, landing the cleaner combinations. Griffin taunting Sherk, inviting him in for a free punch. Sherk obliges and Griffin responds with a nice combo of his own. The two begin to slug it out for a moment, much to the pleasure of the crowd. R3 – Griffin rocks Sherk for a moment but the former champion recovers quickly and responds with an exchange of his own. The output by these two lightweights is incredible. Griffin taunting Sherk a little. Sherk beginning to land more when he comes steps into the pocket. The fans begin to cheer with less than a minute left. 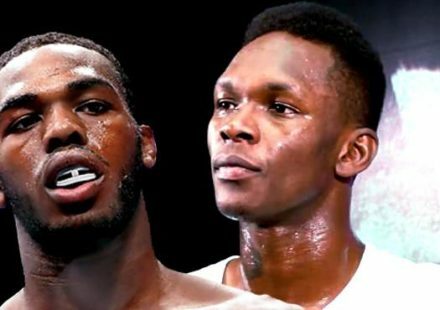 A play-by-play doesn’t do this fight justice, it needs to be seen. The final round was very close. Both fighters enter the cage quickly. Drew is cornered by Tim Sylvia while Thales is cornered by Vitor “Shaolin” Ribeiro and Andre Pederneiras. R1- Thales takes McFedries down early. He postures up and eventually gets Drew’s back. Leites uses his right leg to immobilize McFedries’ right arm and then sinks in the rear naked choke. Shannon Gugerty enters first with head phones and hood on. He is accompanied by Dean Lister. Spencer Fisher comes out to loud cheers by the crowd. Matt Hume is in his corner. R1- Gugerty starts with low kicks as Fisher closes off the cage. The two clinch and Gugerty gets the takedown. Fisher eventually gets back up and lands a standing elbow from the clinch. Fisher lands another nice elbow that sends Gugerty back. Fisher beginning to let his hands go more while Gugerty can only offer takedown attempts. Fisher drops Gugerty with a right hook and the round ends with an unsuccessful takedown attempt by Shannon. Docs check on a large cut over Gugerty’s left eye in between rounds. R2 – Shannon lands a nice body kick but then slips with another kick attempt. He promptly gets back up and the two clinch against the cage. The two break free. Gugerty attempts a few front kicks. Fisher is still the aggressor and gets a takedown. He falls into a guillotine attempt by Gugerty but eventually gets out. Gugerty immediately throws multiple high kicks after the separation. Fisher gets a takedown and lands in full guard. Round ends with Fisher on top. R3 – Gugerty goes for a clinch early, breaks and beings to throw kicks with more regularity. Gugerty powers Fisher down and lands in his guard. Fisher locks in a triangle choke but Shannon holds on, giving the occasional ‘thumbs up’ to the ref. Fisher is unable to finish Gugerty with the triangle due to his awkward positioning. Fisher rolls to his back and gains full leverage, forcing Gugerty to tap. Matt Horwich runs down the aisle, holding a bible and sporting a Mohawk. Matt Lindland and Dan Henderson accompany Horwich. Brazilian Jiu-Jitsu brown belt Dan Miller strolls in with confidence, greeting a few fans on the way. R1- Miller gets a takedown right away is dropping right hand bombs. Miller postures up and Horwich lands a nice up kick. Horwich attempts an omaplata but Miller escapes. Horwich scoots back to the fence and gets back up. Horwich lands some knees in the clinch before defending a takedown, Matt is in position for an armbar attempt but eventually lets go. Miller throwing small strikes in Horwich’s guard. The two get back up and clinch against the fence. Miller lands a nice one-two combo before taking Horwich down. Miller lands in an omaplata but escapes as the round ends. R2 – Horwich stuns Miller early with a short left but Miller gets the takedown. The two get up but Horwich drops down with an armlock attempt. Miller escapes and is in Matt’s full guard. Horwich utilizing the rubber guard again forcing Miller to escape as Horwich gains top control. Horwich takes Miller’s back and attempts a rear naked choke. Miller tucks his chin and escapes, much to the pleasure of the fans. Horwich gets full mount briefly but Miller rolls to his back to cover. Round ends with Horwich attempting another rear naked choke. R3 – Miller gets the takedown to start the third. Horwich attempts another omaplata but Miller escapes this time, landing an elbow. Horwich using the rubber guard to once again attempt for an omaplata but Miller is keen to the move this time. Miller is controlling Horwich against the cage but isn’t throwing a lot of strikes; the fans boo and chant “stand them up.” Miller beginning to show a little more offense, throwing short elbows as Horwich tries to neutralize with the rubber guard. Horwich is bleeding under his left eye. Round ends with Horwich landing a couple of up kicks. Marcus Aurelio enters first, proudly carrying the American Top Team flag behind him. Gesias “JZ” Calvancante is in his corner. Hermes Franca comes out to the tune of “Crazy Train” and is seen with a confident smirk on his face. Fans cheer as he enters the Octagon and Franca purposely shoves Aurelio as he makes his way around the cage. The little altercation is broken up quickly. R1- Franca swings wildly right away. Hermes lands a low kick while Marcus jabs. Franca lands another hard low kick that gets Aurelio’s attention. Both fighters have periods of moving forward with Hermes throwing wide hooks and leg kicks while Aurelio is content to counter with jabs. Franca lands a nice straight right followed by another low right kick, Hermes is becoming more effective with his kicks. Fans boo after the round ends. MMAWeekly scores R1 10-9 for Hermes Franca. R2 – Franca landing low kicks to start the round; mixing things up with high kicks on occasion. Marcus attempts a double leg but is defended by Hermes, who counters a very hard low kick. Aurelio is showing signs of the damage to his leg. Marcus lands a jab is once again countered by a Franca low kick. Fans begin to get a little restless. Aurelio lands a nice right and Franca lands another low kick that makes him stumble. The two exchange but neither fighter is landing clean. The slap from another powerful leg kick by Franca could be heard near the end of the round. MMAWeekly scores R2 10-9 for Hermes Franca. R3 – Franca is the aggressor early on, continuing his staple of low kicks and wide hooks. Aurelio gets a takedown and lands in half guard. Marcus is throwing hammer fists while Hermes stalls. Franca gets back up and Aurelio lands a questionable knee, forcing the ref to momentarily halt the fight. Both come back out more aggressive. Marcus gets a takedown attempt stuffed. The American Top Team fighter attempts another takedown, pushing Franca up against the fence. Hermes escapes and the two move back to the center. Franca throws a three hook combo and then taunts Aurelio as the round comes to a close. MMAWeekly scores R3 10-9 for Hermes Franca. Pete Sell enters confidently into the cage accompanied by former UFC champion Matt Serra. Josh Burkman, sporting a full beard, greets the fans as he makes his way down the aisle. R1- Fighters circle early, showing respect. Burkman throws a leg kick that is countered by Sell. 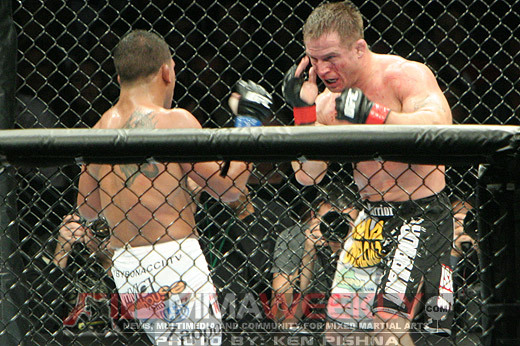 The two clinch against the cage. They break free and Burkman rocks Sell with straight right, then takes him down. Burkman lands elbows from half guard. Josh lets Sell get back and takes him back down, “Drago” gets full guard now. Burkman lets Sell back up again. The two clinch again and Burkman stomps on his opponent’s feet. Josh hip tosses Sell in the center of the Octagon. A brief exchange ends the round. R2 – Both fighters exchanging with Burkman getting the better of Sell. Pete attempts a takedown but is defended well, the two move back to the center. Burkman stuns Sell with a counter left but the Team Serra fighter recovers quickly. Sell hits Burkman and he slips backwards, the two clinch momentarily. Sell starting land some nice shots as Josh seems to be fatiguing. Sell beginning to gain confidence, throwing more punches. Round ends with Burkman taking Sell down. R3 – Burkman lands a knee. Sell tries for a takedown but is stuffed. After a few small exchanges, Sell is unsuccessful with a single leg takedown attempt. Neither fighter landing clean but Sell is the aggressor, moving forward. Burkman tries a takedown but then switches to a knee to the body. Sell landing some nice stiff jabs. Burkman is clearly fatigued as he backtracks around the cage perimeter. Sell gets a takedown, landing in half guard. Sell attempts a neck crank as the bell sounds.